it’s been a while since I posted anything, so therefore, on this last day in May I decided it’s time.. for a blog. May has been cold where I live, in fact the coldest May recorded in 19 years. Another side effect of climatic changes and global warming? Some would say yes. Others would say… hogwash, just another example of fluctuations, of natural variables. Weather, local or global is and have always been… unpredictable. Below what someone woke up to on May 29th, and the snow kept coming down that day. Further up in the mountains of Norway they still prepare skiing tracks & slopes. THAT.. is not very common late in May, although the die-hard skier can find places to ski in this country, even during summer. Here’s more info. We’ve not seen any significant changes to the Gulf Stream yet, though variations have been recorded. But “doomsday prophecies” have been published. Yeah that’s a bit over the top, but the prospects are, if one believes those predictions, quite grim. Melting of Greenland ice will cool down the northern oceans, change currents and ultimately, some claim, also affect the Gulf Stream. Which for me is a good thing. 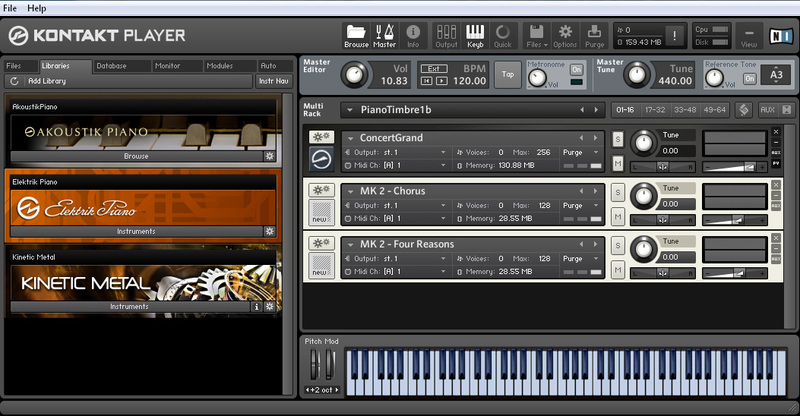 I love playing keyboards, and with various sounds. Got quite lots of software instruments. Once upon a time a (half) decent keyboard player, composer and arranger, who’ve made (some would say) quite a bit of strange music. Self taught, like in other disciplines, an autodidact who’ve never played one straight classical piece or standard jazz tune from start to finish. Ever. Below some of my favorite musical desktop components. Not yet recorded anything new I’d like to share, but it is getting there. Got ideas in plenty. So encouraged by progress I am considering to try to find someone to play with. Jazz Fusion oriented music, improvisational, that’s where I’d like to explore things, together with others. It would be cool if it happened, suppose it will or might if meant to happen. Finally gave in to desire, succumbed to plain MC-lust. One day in May, after several years of tinkering and talking desire morphed into realism, into action. When you get older you compensate by wanting (new) toys. Well some do, guess I do too. Things to make us feel younger, make us feel alive. A thrill seeking desire might be the right way to put it? Used to ride MC’s but .. that was back in the 70s and 80s! Started off looking at big (and too expensive) MC’s but quickly came down to Mother earth. What if MC riding wasn’t as I recalled from back in the day? What if I didn’t like it? What if.. it felt awful? And foremost, why spend a fortune (especially when not having one) on something as seasonal as a MC? Well.. seasonal here anyway. Fate intervened, fate decided, fate dictated the outcome. Fate has a tendency to do that, whether you believe in fate or not. One day it appeared in the ads. An older trustworthy bloke had something older trustworthy for sale. It was cheap. Friends told me it was a steal. A few days later it was parked outside, at home. Despite poor (or was it pour[ing]) weather I’ve covered quite a few miles on my new buddy. Characterized by some MC Journalists “as dull as dishwater”, the above two-wheeler turned out to be exactly what the doctor’s ordered. 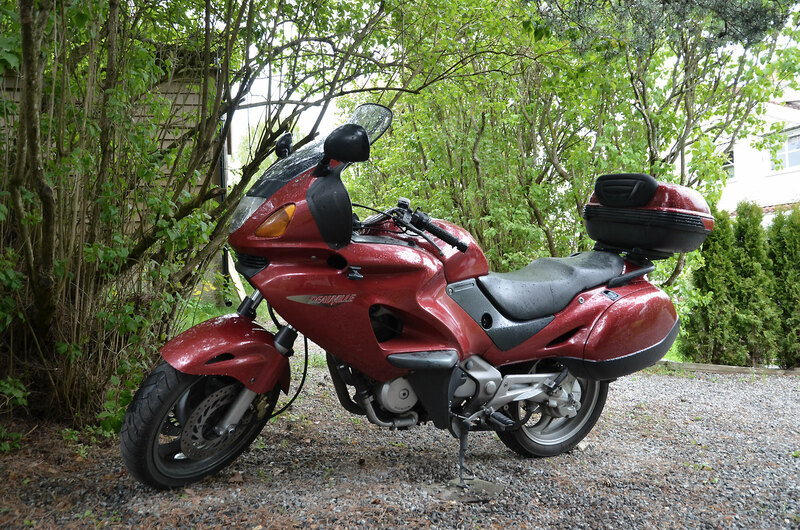 A sturdy, durable, easy too drive shaft driven Honda NT650 Deauville (also nicked Dullsville). On the contrary, It’s quiet, you sit comfortably, it produces very little vibrations, got bags/space enough to pack up and go.. anywhere. Mileage is good too. It’s not a rocket but it will get you most anywhere. I can tell it will get me anywhere I want to go. And that is the project this summer. This entry was posted in Daily rant, this & that, Environment, life, politics, MC related, miscellaneous, MC rides, trips & adventures and tagged Change, Inspiration, Life, MC related, Music, Tools. Bookmark the permalink.